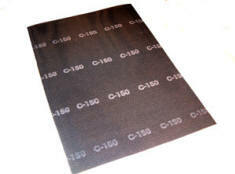 Our sandscreen is a heavy duty cloth coated on both sides with premium silicon carbide grain Excellent for light stock removal and finishing of hardwood and concrete floors. For use on buffing machines. All of our products are Made in USA from the finest quality materials. Mount sandscreen using a nonwoven floor pad between the driver and sandscreen. Sold in boxes of 10 sheets except the drywall sheet pricing is for 50 pieces. Also sandscreen edger discs in 60, 80, 100, 120, 150 & 220 grits. Contact us for pricing. Listed by part number over the box prices. All priced 10 per box except the drywall is 50 per box.